On March 30, 1996, Scarlett and her five kittens were in an abandoned garage allegedly used as a crack house in Brooklyn when a fire started from undetermined causes. The New York City Fire Department responded to a call about the fire and quickly extinguished it. When the fire was under control, one of the firefighters on the scene, David Giannelli, noticed Scarlett carrying her kittens away from the garage one by one. 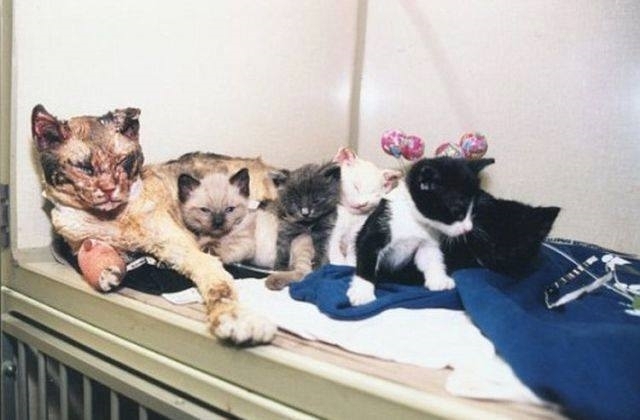 Scarlett herself had been severely burned in the process of pulling her kittens from the fire. Her eyes were blistered shut, her ears and paws burned, and her coat highly singed. The majority of her facial hair had been burnt away. After saving the kittens she was seen to touch each of her kittens with her nose to make sure they were all there and alive, as the blisters on her eyes kept her from being able to see them, and then she collapsed unconscious. A mother’s courage saved her babies from certain death. Powerful. I saw that a few years back. I think people were lined up to adopt her and her babies. Thanks for re-posting it. I love animals, especially cats. Nature is awesome. Brought tears to my eyes. It’s nice to hear a positive story from your blog against the negative media! What a great story of a meower! I remember hearing this on the news. I wept at her love and bravery and thought of human mothers who do so much less for their children. Greater love hath no one that they would lay down their life or suffer for those they love. yes, I was about to say the same thing too. I would love to reblog this too. Please let me know if ok with you. Overwhelming love for all of them.